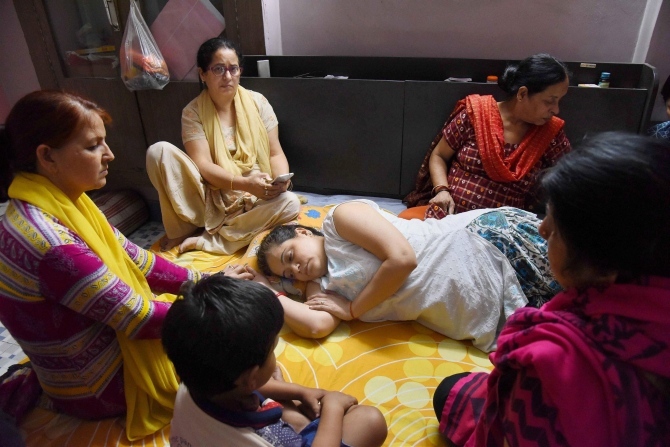 Mother of Aditya Sachdeva, who was shot to death on Saturday night, has demanded a speedy trial and death penalty for Rocky Yadav, son of Janata Dal-United Member of Legislative council Manorama Devi who is accused of killing Aditya for overtaking the latter’s SUV. After Rocky was arrested by police on early Tuesday, Aditya’s mother Chanda, told rediff.com that she wants justice. “I want a speedy trial and death penalty for Rocky as such justice can give a hope for all, not just us. People cutting across caste, religion and community in Gaya have been demanding stern action,” she said. Chanda has been inconsolable since she was first informed about Aditya, 20, a promising young man from their business family. According to family members, Chanda’s tears are running non-stop and she repeatedly says that Rocky should have killed her instead. Aditya’s elder brother Akash and his uncle Rajeev Ranjan said Rocky deserves punishment and should not be given less than a death penalty for his crime. “We are common people; the accused is rich and powerful and enjoys political clout. The state government should order a speedy trial in this case for justice,” they say. A visibly-upset Akash said, “Rocky has snatched my brother and the son of my mother and father. He has made our life miserable and full of pain”. “My father Keshav Chand Sachdeva is in shock. He often cries, and is unable to accept that Aditya has been cremated,” Rajeev said. Inspector General of Police (Patna Zone) N H Khan, who is camping in Gaya after Aditya was killed, said that the police will file a charge sheet against Rocky as soon as possible and will conduct a speedy trial. Bihar Chief Minister Nitish Kumar had said on Monday that his government would not spare anyone found guilty and stern action would be taken as no one is above the rule of law. “A special investigation team has been constituted and the police is on hot pursuit of the fugitive offender.... the police is working independently without any influence from any quarter,” he had said.